Sitting on the train en route to the big smoke, my daily newspaper gladly informed me that today was National No Music Day (Wednesday, 21st November 2007). It is an annual attempt to highlight the dull monotony of much of today’s music. The constant barrage of meaningless noise we are forced to endure, everywhere from high street stores and greasy spoon cafés, to the radio and dental waiting rooms. Organisers were urging the great British public to leave their ipods at home, not to open record shops, and to even stop the milkman from whistling! The irony that National No Music Day co-incided with the first UK headlining appearance of one of the world’s most influential progressive metal bands was not lost on me, as I read that one of the people behind the Day had even urged rock bands not to rock. Thankfully Fates Warning seemed blissfully unaware of the call to lay down their instruments, as they hit the stage with a crushingly heavy version of One. 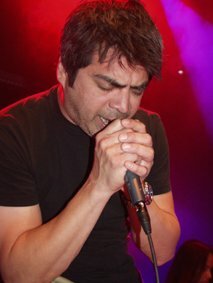 The only previous appearance of Jim Matheos and his four colleagues on these shores, was a support slot on Dream Theater's Awake tour, way back in 1995. I had finally managed to see one of my favourite bands play a blinding set of classic metal at Amsterdam’s Headway Festival last year. Whilst the set list was pretty much the same in London – a pretty comprehensive ‘best of’ – there was an extra level of intensity and energy to the performance that made this even better. Any band that can slip three of the most sublime slices of progressive metal ever created, into the middle of a set, can never fail to put on a great show. The segue of a section of A Pleasant Shade Of Grey, followed by The Eleventh Hour and Point of View was perfectly delivered. Elsewhere we had Quietus and Silent Cries from the 19-year-old No Exit album, and Another Perfect Day from their most recent release. This ably showed that Fates Warning is a band that has never failed to deliver across more than two decades of music-making. The only disappointment was the surprisingly low turn out. Only 150 tickets sold, meant the atmosphere and energy that a packed Underworld can generate, was sorely missed. Perhaps it was the relatively short notice of the date, or the fact that England were getting knocked out of the European championship that night, or perhaps everyone else had read the same article as I had, and vowed to support No Music Day by staying at home. Whatever the reason, you all missed a great night of music performed by one of the most influential bands the metal genre has produced.